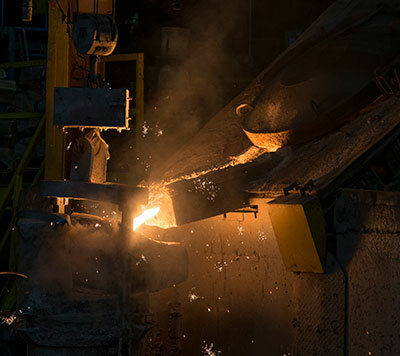 During the melting process, various elements are added to the furnace to keep the chemical composition of the iron within the specified limits for the particular grade that's being poured. After the proper chemical composition has been achieved, the furnace is "tapped". During the tapping process the entire furnace is tilted forward and the molten iron is poured into a Tundish or transfer ladle. Throughout the process , slag (impurities) are removed using a coagulent for concentrating the impurities and a slag spoon for their physical removal. All cast iron and steel have elemental iron (symbol Fe) as their main component. The primary difference between iron and steel is carbon content, with steel having a much lower carbon content when compared with cast iron. 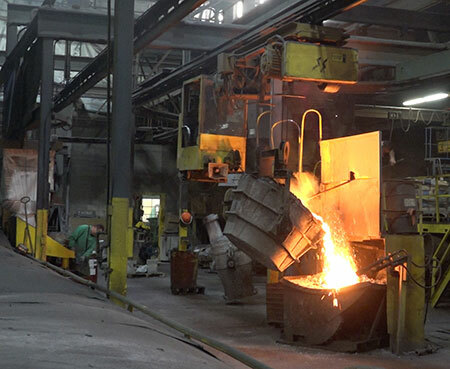 Though we produce iron that conforms to a variety of specifications, the iron we pour can be broadly classified as one of two types for cast iron. Grey iron- this is a basic type of iron that has the carbon distributed throughout its matrix in flake form. Ductile iron- the carbon in this type of iron is distributed in nodules that are spread throughout the microstructure of the iron. During the production of ductile iron, magnesium is added to the bottom of the Tundish ladle. Iron is then tapped into the Tundish ladle on top of the Magnesium. The resulting reaction causes the carbon to coalesce into nodules spread throughout the microstructure of the iron. This results in greater ductility. Molten iron is moved in a transfer ladel from the furnaces to the individual pouring ladels. 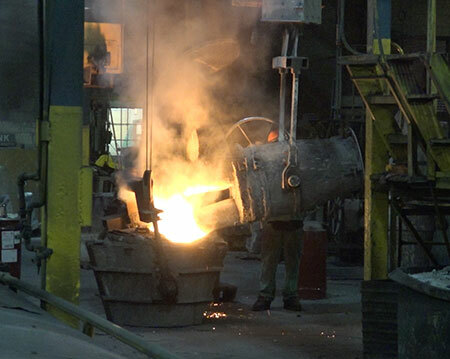 At this point one of our foundry personnel pour the iron into each individual mold.